Summary: A coyote explores a nighttime suburban neighborhood, looking for food to bring back to his family’s den in a cemetery. He is unsuccessful in catching a mouse and a rabbit; geese at a neighborhood pond chase him away before he can get to their eggs. Just before dawn, he manages to kill a turkey. His song awakens a little girl, who looks out her bedroom window to see him walking through her backyard. Finally, he returns to his den, where his family eats, then falls asleep for the day. The last two pages contain a wealth of coyote facts and some books and websites for further research. 32 pages; ages 4-8. Pros: An interesting and positive look at an animal that (I learned from this book) lives in every state except Hawaii, and is often considered a nuisance at best and a danger at worst. 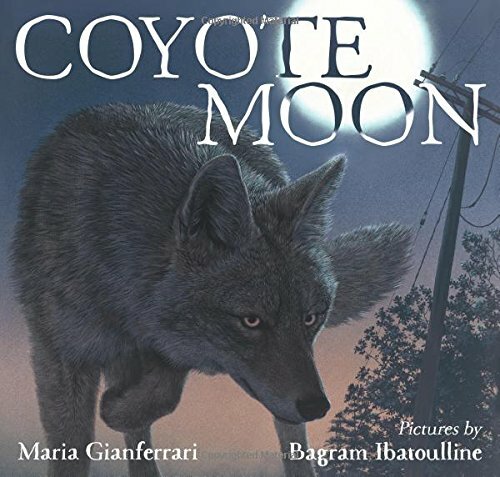 The illustrations are stunning and realistic, capturing the coyote’s beauty and movements perfectly. Cons: Given the prevalence of coyotes in the U.S., it would have been helpful to offer tips about what to do if you encounter a coyote. Thanks for featuring Coyote Moon here, Janet!! Too bad you’re so far away. I’m doing another book signing in NH on Sunday for both Coyote Moon & Penny & Jelly Slumber Under the Stars :).